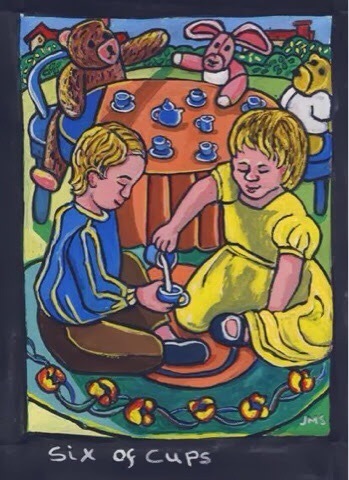 Nostalgia and memories are the typical embodiment of the 6 of Cups, and to see it on a Monday really feels to lend a positive beginning to the work week. Perhaps you have plans to meet up with a long-time acquaintance for coffee or lunch, so as to reminisce of the old days. Typically, Monday can be a day fraught with anxieties, crises, and challenges. The 6 of Cups serves as a reminder to take time out to stop and smell the roses. Chill would be a great attitude to adopt for the day. In recent days, the news outlets have been flooded with old photographs and video reels of past Royal Weddings. There is definitely a fair amount of nostalgia associated with these, and we also can see the evolution of society along the way. This entry was posted in Card of the Day, General Tarot, Patreon, Readings, YouTube Videos and tagged 6 of Cups, Card of the Day, Guidance, Path, Reading, Tarot.